birdRS: Front cover of Nature journal for in-situ monitoring of bald Ibis v-formation flight. Front cover of Nature journal for in-situ monitoring of bald Ibis v-formation flight. Having your research in Nature is one great achievement and to put the icing on the cake Steven Portugal (RVC, UK) and colleagues got the front cover photo too - congratulations. Tagging these Northern bald ibises (Geronticus eremita) that had been specifically trained to follow a paraplane, the authors measured speed, direction, and position of 14 birds during a 45 minute flight. 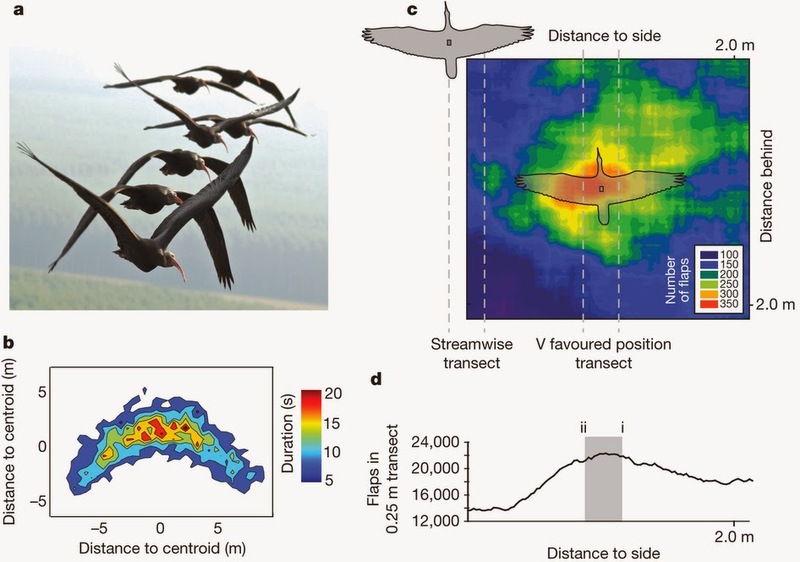 Figure 1 below is a nice summary of the positioning data, with panel C a clear presentation of the preferred distance to the neighbouring bird as measured by the area of greatest number of wing flaps over time. I'm not sure I agree with the 'News and Views' authors first statement: "The elegant V formations of migrating birds provide a picturesque harbinger of summer's end, but why do the birds fly in such a precise formation?" Surely 'Why' is not the question but 'How'? 'Why' is answered by millennia of evolution determining the best-fit flight patterns for survival, it is answering the "how" that drives us scientists to investigate. a, Northern bald ibises (G. eremita) flying in V formation during a human-led migratory flight (photograph M. Unsöld). b, Three-dimensional location histogram of the 7 min flight section, showing position of individual ibises (n = 14) in the V formation, with respect to flock centroid, measured by a 5 Hz GPS data logger. The colour scale refers to the duration (in seconds) a bird was present in each 0.25 m × 0.25 m grid. A plot detailing the formation shape for the duration of the entire flight can be found in Supplementary Fig. 7.
c, Histogram of number of flaps (colour coded) recorded in each 0.25 m × 0.25 m region between all birds and all other birds. Most flaps occurred at an angle of approximately 45° to the bird ahead (or behind). Transects denoted by dashed lines, directly behind or along the most populated V favoured position (just inboard of wingtip to wingtip), are the same as those detailed in Fig. 3.
d, Histogram detailing the total number of flaps recorded between each bird–bird pair, with respect to position of the following bird. The shaded area (ii–i) denotes the limits of optimal relative positioning, based on fixed-wing aerodynamics.